Pressure washing can be used for cleaning practically any surface. This includes: mud, dirt, mold, paint, chemicals, chalk, grime, and dust. From but not limited to: Cars, houses, buildings, wood, and concrete. A pressure washer is in the simplest terms; a motor hooked up to a high pressure water pump, hose, and trigger switch. There are two types of pressure washers. The first is an electric pressure washer. Mostly used for non-commercial jobs because they provide less pressure for the smaller jobs. At one thousand psi (pound per square inch) electric pressure washers are smaller, lighter, more portable, quieter, and generally cost less. They may also have a tank option for detergents or chemicals. Perfect for residential jobs such as; cleaning cars, grills, siding, decks, and drive ways. The second type of pressure washer is a gas pressure washer. It is used for bigger commercial jobs. Using a gas in the pressure washer kicks out up to three times the psi (pounds per square inch) although gas pressure washers require more water. Due to having higher pressure, gas pressure washers are perfect to use on roofs, heavy machinery, large vehicles, and commercial buildings. The pressure created by the pressure washer makes it easy to get into small crevasses and into porous materials and remove anything that may have built up onto it. Having this advantage can make the object or surface a different color after cleaned making it appear brand new. Elkhart Landscape For Pressure Washing Services offers clients a variety of fine pressure washing services that include exterior home pressure washing for brick homes, vinyl siding homes, low pressure washing for rooftops, decks pressure washing, pressure washing for concrete slabs, walkways, and driveways, and more. Our licensed and insured pressure washing services can be customized for each client. We can provide our excellent pressure washing services to both residential home owners and commercial business owners. Our pressure washing services are affordable and low priced and we can serve your area and the surrounding towns. Call to inquire about our pressure washing prices today. We use top name brand and high quality pressure washing equipment to perform excellent pressure washing jobs. We can provide our clients with great pressure washing tips and advice to help them maintain the newly pressure washed area for a long time. Pressure washing can provide many great benefits for home siding like removing discoloration caused from mold, mildew, and other weather conditions. Pressure washing for rooftops can prevent dirt buildup under shingles and remove discoloration from rooftops caused by mold or mildew. Our company can pressure wash metal roofs, shingle roofs, slate roofs, cement roofs and more. Pressure washing can be done during any time of the year. During the spring and summer seasons are the best times for pressure washing because the weather is warm, but it can be done just as good in the fall or winter, but should be avoided during rain or snow. Pressure washing is designed to clean many surfaces making them look fresh and new again. When you use the right type pf pressure washer machine, then it will not take long to complete the job. Pressure washing can be low pressure and high pressure wash. Each is designed or different jobs. Cement cleaning jobs may benefit from a high pressure wash and shingle roof cleaning jobs may benefit from low pressure washing. Our company can arrive at your home or business to do any type of pressure washing job you request. Our prices are reasonable and every job comes with a complete guarantee. Our pressure washing crew can explain the cleaning method being used to clients, whether a low pressure or high pressure will be used. If you have concerns about how to pressure wash a house, then ask our experts. Our pressure washing chemicals are environmentally friendly. Let our experts explain the difference between pressure washing vs power washing. 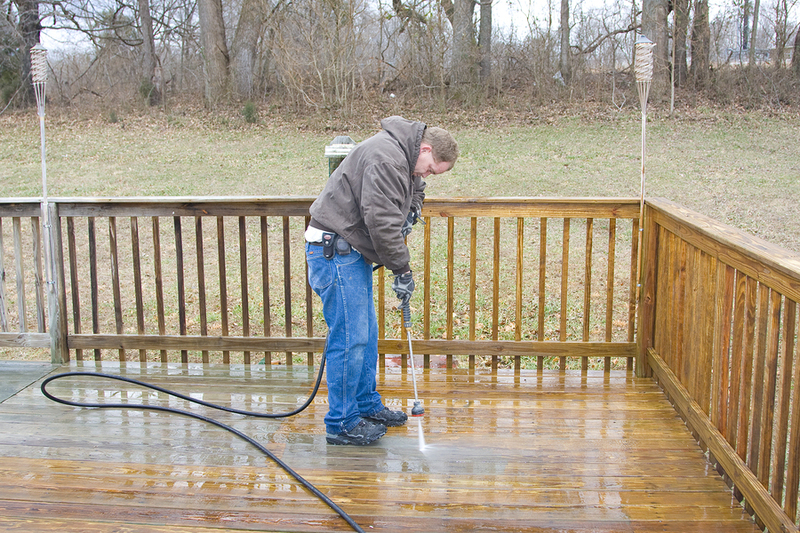 Pressure washing concrete and pressure washing deck can save you from having to paint it again. A pressure washing job can save you time, money, hassle, and a painting job. Give us a call to let us help you determine if pressure washing will benefit you. Our friendly customer service department can schedule flexible and convenient appointments. Your home, cement, walkways, driveways, deck, roof and more can look clean, neat, and nice all throughout the year with pressure washing. Our company performs the best pressure washing jobs in the area.